IlPecorino Casu Sardu è un formaggio prodotto in modo artigianale dai pastori sardi con latte misto di capra e di pecora. IlPecorino Casu Sardu è un prodotto tipico della regione Sardegna con un sapore deciso e davvero unico. The fresh Sicilian pecorino produced with sheep's milk is flavoured with pieces of dried tomato which gives the pecorino of Nebrus a unique and irresistible taste. The pecorino has a short seasoning, the paste is white with pieces of tomato inside. The fresh Sicilian pecorino produced with sheep's milk is flavoured with pieces of stuffed green olives which gives the pecorino of Nebrus a unique and irresistible taste. The pecorino has a short seasoning, the paste is white with pieces of stuffed green olives inside. IlMoliterno è un formaggio prodotto con latte di pecora prodotto in Sardegna. Il Moliterno ha un sapore sapido e deciso, presenta una lieve occhiatura. La forma del formaggio viene data dal tipico canestro utilizzato. La pasta è bianca con qualche occhiatura. Ilpecorino romano è il formaggio prodotto da latte di pecora più antico, infatti las toria di questo formaggio risale agli antichi romani. Size 500 g | 1 Kg. Pecorino is produced with sheep's milk from local farms. The pecorino cheese during the preparation is added to the black truffle that gives it a typical aroma. Pecorino with truffles has white paste tending to straw yellow, with pieces of black truffle visible inside. Pecorino is produced with sheep's milk from local farms. The pecorino produced is seasoned as if under the ashes, this process gives typical hints to the cheese. Cheese to be tasted in purity to understand its finesse. Size 750/800g | 1,6 Kg | 3,2 Kg. SAFETY, QUICKNESS AND RELIABILITY. TOGETHER IS MORE FUN AND TASTY. TASTE EXPLORERS. IlPecorino Testa Nera è un formaggio prodotto con latte di pecora selezionato a pasta semicotta. Ottimo da assaporare in purezza. Size 500 g | 1 kg| 1,5 C.A. KG Forma intera. SAFETY, QUICKNESS AND RELIABILITY. IlPecorino Testa Nera è un formaggio prodotto con latte di pecora selezionato a pasta semicotta. Ottimo da assaporare in purezza. SAFETY, QUICKNESS AND RELIABILITY. TOGETHER IS MORE FUN AND TASTY. TASTE EXPLORERS. The fresh Sicilian pecorino produced with sheep's milk is flavoured with pieces of rocket saladwhich gives the pecorino of Nebrus a unique and irresistible taste. The pecorino has a short seasoning, the paste is white with pieces of rocket saladinside. Ilpecorino Bucaro al pepe è un formaggio prodotto con latte di pecora prodotto in Sardegna. Ilpecorino Bucaro al pepe è un formaggio che si presenta di crosta color arancio, tipica dei formaggi canestrati, pasta bianco avorio con all'interno dei grani di pepe intero. The fresh Sicilian pecorino produced with sheep's milk is flavoured with pieces of olives, chilli and rocket which gives the pecorino of Nebrus a unique and irresistible taste. The pecorino has a short seasoning, the paste is white with pieces of olives, chilli and rocket inside. The fresh Sicilian pecorino produced with sheep's milk is flavoured with pieces of walnuts which gives the pecorino of Nebrus a unique and irresistible taste. The pecorino has a short seasoning, the paste is white with pieces of walnuts inside. IlPecorino Fiore Sardo DOP si presenta con crosta dura e rugosa, la pasta è di colore paglierino-marrone in quanto dipende dall'affumicatura. Size 400g | 800g | 1,6Kg | 3,25Kg. SAFETY, QUICKNESS AND RELIABILITY. Pecorino seasoned with honey is a unique delicacy from Tuscany. Pecorino is produced with sheep's milk, while honey is added to the paste. The pecorino matured with honey is brown color with regard to the crust, and ivory white the interior. The pecorino is produced with milk from sheep raised in the area. During the preparation of the pecorino cheese, pears are added, giving it a typical fresh and fruity aroma, but not a sweet one. Cheese to be tasted in purity to understand its finesse. IlPecorino Testa Nera è un formaggio prodotto con latte di pecora selezionato a pasta semicotta. Ottimo da assaporare in purezza. Size 500 g | 1 kg| 1,5 KG Forma intera. SAFETY, QUICKNESS AND RELIABILITY. Ilpecorino Bucaro è un formaggio prodotto con latte di pecora prodotto in Sardegna. Ilpecorino Bucaro è un formaggio che si presenta di crosta color arancio, tipica dei formaggi canestrati, pasta bianco avorio. SAFETY, QUICKNESS AND RELIABILITY. TOGETHER IS MORE FUN AND TASTY. TASTE EXPLORERS. This cheese has the peculiarity that during the processing and the creation of the pasta is added the Chianti DOCG which makes the cheese unique. The cheese has a unique aroma due to the presence of Chianti and an intense flavor. 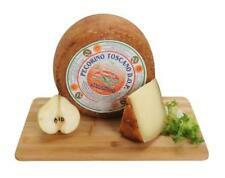 The Tuscan pecorino is white, with small holes, in the mouth the taste is persistent with a balanced spiciness. TASTE EXPLORERS. Size 1,5 kg c.a. Pecorino di Fossa is a cheese that still retains the characteristic of being aged in Tufo caves. The origin of this cheese is to be found in areas between Marche and Emilia Romagna. The cheese is placed in cotton bags and matures for about three months during which Pecorino loses about 20% of its weight and acquires aromas and hints of cave aging. Size 500 g | 1 Kg. SAFETY, QUICKNESS AND RELIABILITY. TOGETHER IS MORE FUN AND TASTY. TASTE EXPLORERS. Thepecorino cheese with figs is a unique delicacy of its kind. Pecorino is produced with sheep's milk, while part of figs is added during the processing of the pasta. Pecorino with figs is brownish in color as regards the crust, and ivory white inside. Pecorino Cheese | /- 1 kilo / 2.2 lbs. If the cheese is a piece of cheese, we cut your cheese fresh from the blade and wrap the cheese neatly in vacuum. Fat 50 , pasteurised ewe’s milk, rennet, salt, lactic acid. If the cheese is a piece of cheese, we cut your cheese fresh from the blade and wrap the cheese neatly in vacuum. Fat 50 , pasteurised ewe’s milk, rennet, salt, lactic acid. We will always help you to have a 100% positive happy buying experience.